The requirements, imposed by the Dodd-Frank Act, were put in place to ensure that critical financial institutions could weather economic storms. 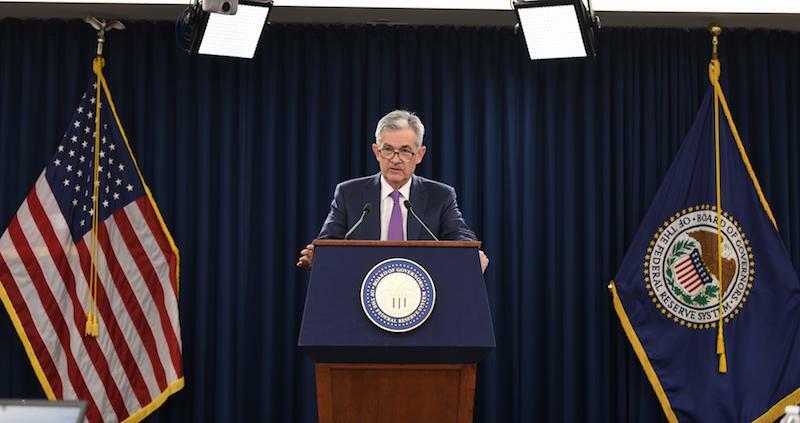 Chairman of the U.S. Federal Reserve Jerome Powell speaks during a news conference on September 26, 2018 in Washington, DC. The bill exempted smaller banks from compliance with Volcker. The same month it passed, the Fed proposed sweeping changes to further weaken Volcker, shifting the burden of proof on compliance on each trade from the banks to oversight agencies. A review of the comments shows the banks commending the Fed for relaxing the rules. But it also shows many bankers carping that regulators were enlarging the universe of securities that would be considered when determining if they were in compliance; establishing new demands that bank CEOs attest each year that they have the proper rules in place; and, all in all, asking for changes that would risk increasing industry oversight costs. Thanks for the concessions, they said in so many words. But we want more. The Volcker Rule, as it stands, makes a distinction between the trading a bank does on behalf of customers, which is allowed, and the trading it does for its own gain, which is not. The rule limits the ability of banks to invest in so-called covered funds, unless it’s done to hedge their positions or on behalf of customers. The idea is that American taxpayers should not be on the hook for blunders that banks make in their own risky trading. The Volcker Rule would make a financial crisis much less likely, according to Marcus Stanley, policy director at Americans for Financial Reform. But even the current muscular rule hasn’t yet been aggressively enforced. In the three years since Volcker took effect, only Deutsche Bank has been penalized for a violation, and that was a case in which the bank self-reported that its compliance program was inadequate — not one in which regulators took the initiative. The Fed proposal released in May offers new compliance exemptions that include trades that are made in error. Bartlett Naylor, financial policy advocate at Public Citizen, reminded regulators in his letter that it was trades by Nick Leeson in Barings Bank’s “Error Account 88888” — created by Leeson specifically to hide losses — that “collapsed the bank” in 1995. The May proposal additionally would let some banks off the hook from performing analyses to prove that the activity in their accounts was hedging, not proprietary trading. Throughout the decadelong brawl over Dodd-Frank and the Volcker Rule, banking industry supporters have argued that the reforms would damage market liquidity, bank earnings, job growth, and the economy. That same refrain was visible throughout the comment letters. Yet the SEC concluded in a study released just last year that the agency could find no empirical evidence to support the theory that liquidity had declined in the wake of the passage of the Dodd-Frank Act in 2010. It also pointed out that the issuing of market securities had not declined and that the private market issuance of debt and equity had increased substantially. The Volcker Alliance, a nonpartisan public policy organization, echoed these findings in its comment letter, reminding regulators that the United States is in its second longest expansion in recorded history, bank profits are soaring, trading volume is near an all-time high, and unemployment is at its lowest in nearly 50 years. “There is no apparent justification for this proposal,” they wrote. Just days after the public comment deadline, Wall Street combatants began to meet with regulators in an attempt to influence the inevitable revisions to come. On October 22, four officials from SIFMA met with Elad L. Roisman, a Republican SEC commissioner, and four of his lawyers.